24 cm xvii, 399p. : ill.
Hadrian's reign (AD 117-138) was a watershed in the history of the Roman Empire. Hadrian abandoned his predecessor Trajan's eastern conquests - Mesopotamia and Armenia - trimmed down the lands beyond the lower Danube, and constructed new demarcation lines in Germany, North Africa, and most famously Hadrian's Wall in Britain, to delimit the empire. The Emperor Hadrian, a strange and baffling figure to his contemporaries, had a many-sided personality. Insatiably ambitious, and a passionate Philhellene, he promoted the "Greek Renaissance" extravagantly. But his attempt to Hellenise the Jews, including the outlawing of circumcision, had disastrous consequences, and his "Greek" love of beautiful Bithynian boy Antinous ended in tragedy. 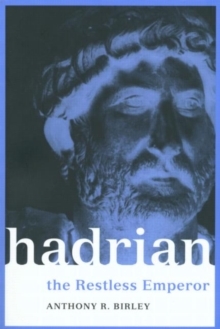 No comprehensive account of Hadrian's life and reign has been attempted for over seventy years.In Hadrian: the Restless Emperor , Anthony BBirley brings together the new evidence from inscriptions and papyri, and up to date and in-depth examination of the work of other scholars on aspects of Hadrian's reign and politics such as the Jewish war, the coinage, Hadrian's building programme in Rome, Athens and Tivoli, and his relationship with his favourite Antinous, to provide a thorough and fascinating account of the private and public life of a man who, though hated when he died, left an indelible mark on the Roman empire.